Are you looking for a list of Jewish Children’s Book Publishers? Continue reading to learn about 17 Jewish publishing houses that also publish books for children. 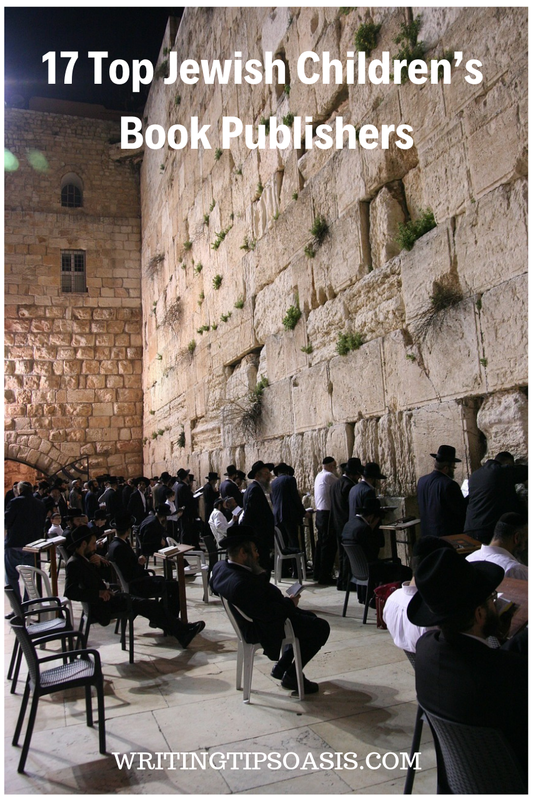 Hachai Publishing is committed to printing and sharing Jewish values, traditions, and beliefs. Teaching children about Jewish faith and their culture through interesting stories, visuals, and characters is their forte. Educational material, library books, and children’s stories that can be read again and again have been printed by Hachai. They are located in Brooklyn and welcome unsolicited manuscripts. They don’t accept violence, romance, animal stories, and ideas that don’t conform to Jewish law and faith. The publisher prints books for children from ages 2-10. You can find the submission guidelines and contact details listed here. The Minnesota based publisher has been in the business since 1974. One of the largest publishers of Jewish children’s books in the world, their titles have been loved and adored by children of all ages. They select only few, quality and premium 18-20 titles annually. Holidays, faith, tradition, history, holocaust, Bible, food, cooking, values, and fiction are some of the subjects they have worked on. Kar-Ben Publishing prints books for children from ages 0-teenagers. The books have easy, fun stories coupled with relevant morals for children. They are practical and imaginative without being too preachy. They don’t publish games or textbooks. You can find the submission guidelines mentioned here. A family business started in 1921 to narrate Jewish values and beliefs; they are situated in New Jersey. David Behrman runs the business today and has maintained the same high standards and high quality. The publisher has been recognized for its persistence in choosing and finding educational, fiction, and non-fiction materials that promote the Jewish faith. Jewish children need textbooks and materials that talk about their culture and history. This gives them a sense of belonging and understanding. The company has also an interest in creating apps and lessons for children of all ages and grades. The submission guidelines and contact details are listed on the page. Philipp Feldheim came to New York in 1939 after witnessing the terror inflicted during the Holocaust in Europe. He came to another country to start a new life. He established a book store selling Jewish books and materials. As curious and eager Jewish readers started to flock to his store, he realized there was a market for Jewish literature. The bookstore eventually was turned into a publisher of innovative, engaging, and exciting literature. Feldheim started printing and publishing historical fiction, cooking, food, novels, short stories, dating, relationships, health, holidays, translations, children’s books, holocaust, history, and comics. You can submit a manuscript to the New York based publisher after reading the guidelines on this page. Judaism is a faith that has many layers and nuances. Jewish Lights Publishing sheds a light on all the rich layers and textures of this faith by printing books, stories, and novels. Whether you belong to the community or want to learn about the culture, their books have the ability to surprise and stimulate you. Readers are encouraged to question the system and delve deeply into tradition, customs, and history. This publisher prints books in genres such as history, fiction, graphic novels, children’s books, holidays, healing, Bible, mysticism, relationships, family, prayer, teens, spirituality, and meditation. Interested writers or authors can consider sending their manuscripts for submission. The guidelines are listed here. Menucha Publishers has focused on creating real, authentic Jewish literature for adults and children. Often touted as the country’s modern Jewish publishers with a strong connect to the past, they are based in Brooklyn. Torah, Jewish literature, and study are just some facets they cover. As a publisher of faith, they take it upon themselves to educate and inspire readers. They aren’t afraid of tackling strong issues and asking the right questions. History, cookbooks, women’s interest, children’s books, young adult and daily study are some of the genres they have printed earlier. Aspiring authors can send their manuscript after reading the guidelines on this page. The Jewish perspective is unique and rare because of their history and heritage. A publisher with Jewish customs and beliefs can relate to the many readers out there who want to communicate with their past and their heritage. Located in Minnesota, they have won awards for their fresh, challenging content. They have printed genres and topics such as novels, fiction, non-fiction and children’s books. Yotzeret prints books for children aged between 5-14 years. They are currently not accepting any manuscripts but you can visit their website for any updates. For the past 50 years, Judaica Press has been dedicated to share and represent honest, real Jewish values and customs. They know the responsibility on their shoulders to portray Judaism in the correct manner to adults and children. If you see their children’s books they have used inspiration, positive values and ideas to give them something to look up to. The motto of the Brooklyn based publisher is ‘Jewish Books Matter’ and that sums up their persistence and passion for the community. Currently they are looking for topics such as history, translations, classics, board books, picture books, self-help, children’s books, novels, young adult, and short stories. Find the submission guidelines explained here for interested authors. Established in 1888, the Jewish Publication Society has been a pioneer in printing Jewish literature. The oldest and non-profit Jewish publisher in the US, they have published books for readers, scholars, and children. Their focus has remained on keeping the debate on Judaism alive and engaging with readers of all generations. With their children’s books they aim to provoke thoughts and questions from an early age. Previous genres and topics include history, Israel, classics, law, children’s books, youth, ethics, culture, music, Bible, and biography. Find the submission guidelines to the Philadelphia based publisher listed here. Ben Yehuda was started to give unconventional books a home. Tired of traditional, overtly conformist publishers that want your theme and book to fit into a pattern, the founders decided to go on their own. Soon they started offering writers of Judaism a chance to narrate their story without any limitations. They respect the strong history connected to their culture and faith. Balancing innovation with tradition, their books have a firm grasp on beliefs and Jewish values. From modern thinkers asking pertinent questions to children’s books narrating inspirational values, they have done it all. Genres such as spirituality, Zionism, Torah, Yiddish, fiction, children’s books, feminism, holidays, Israel, memoirs, and education. Writers and authors can submit their manuscript for consideration here. Alfred J. Kolatch was a Rabbi in South Carolina. He found that many people and Jewish families are not in touch with their faith or heritage. In 1948, he started Jonathan David Publishers to print his books about Hebrew names. The company was named after his two sons and characters from the Bible. Initially his focus remained on equipping Jewish children and adults with books and educational materials about their culture. Religious schools and institutions were some of the first ones to buy their books. As time passed, he started publishing and printing Jewish fiction and non-fiction for readers. In 1970, they moved to an office in New York. Kolatch was a fine writer himself and published several of his works under the company. He’s the author of The Jewish Book of Why, the ultimate guide to Jewish culture, law, traditions, and system. Any query or interest you had about Jewish rituals and faith is answered in the book. Nearly 30 years after its publication, it remains a popular book in its category. They publish spirituality, non-fiction, fiction, children’s books, language, entertainment, history, games, and humor. They are not accepting any submissions currently but you can visit their website for any updates or changes. This independent Jewish publishing house is based in Jerusalem. In 1997, Tzvi Mauer and Moshe Heller started Urim to print and promote classic, contemporary Jewish fiction and non-fiction. Since then they steadfastly dedicated their lives to finding and offering new authors a platform. Debating, asking, discussing real, important questions about Judaism and the community is something they encourage. They have offices in Jerusalem and New York. If you’re Jewish and have a story to share, you can write to Urim. Genres and categories they print include spirituality, children’s books, biography, Israel, women, Jewish thought, Bible, and Jewish law. Read the submission guidelines here and submit a manuscript. An imprint of the Random House publishing group, it was initially founded in 1931. Salman Schocken formed the press to print excellent quality Jewish literature and non-fiction. In 1987, it became an imprint of Random House. The who’s who of the Jewish literary world has worked with this cutting edge, quirky publisher. Harold S. Kushner, Rabbi Jonathan Sacks, Franz Kafka, Elie Wiesel, and Martin Buber are some of the authors who have collaborated with them. They print fiction, non-fiction, children’s books and spirituality. They don’t accept unsolicited submissions. With offices in Jerusalem and New York, Gefen Publishing has given Jewish authors and readers across the world a glimpse into the Jewish faith. From Jerusalem, the heart of Judaism, they raise questions, challenges and ideas that surprise and entice the readers. The old balances wonderfully with the new as their books have evolved to meet the demands of the new generation. Books and genres they print have included Hebrew fiction, translations, cooking, food, children’s books, history, Hebrew non-fiction, Hebrew studies, fiction, literature, diet, Israel, music, Judaism and self-help. The guidelines and instructions can be found here. In 1996, Rabbi Zalman Goldstein decided to start a publishing company to enrich readers’ lives with the Jewish value system. Families, children, and teenagers needed a source of information about the rituals, laws and beauty associated with the Jewish community. It had to be real, useful, and engaging. Rabbi Goldstein was an author and he wrote several books about the law, community, and culture that binds the Jewish people. This small and independent publisher has been rated as one of the top independent publishers by institutions. The focus of the press is on creating a beautiful piece of fiction or non-fiction that echoes the Jewish values and beliefs. The categories printed by them include audio books, spirituality, diet, cooking, children’s books, holidays, and posters. They are not accepting any submissions currently. This dynamic and professional publisher of Jewish literature is known for its contemporary and modern takes. Taking essentially old or ancient customs and ideas and giving them an updated spin or new context is their forte. They have a vast catalog of books that have been bestsellers in the market over the years. All their books and authors merge the modern thought on Judaism with the nuanced history and faith of their community. The categories they print include prayer, audio books, cooking, children’s books, Judaica and translations. You can find the submission guidelines explained carefully here. Ethel Kaplan Simon was an eager student of Hebrew. To her dismay, there were no effective materials to help an adult or mature student to study. The market was full of books and materials for teenagers, children or really advanced learners. In 1976, she wrote her book ‘The First Hebrew Primer’ and launched her publishing company. The book became the definitive guide for mature or adult students who were continuing their education at a later age. It didn’t complicate or confuse matters. The book was simple, easy to use and really practical. The philosophy of keeping it simple is alive even today at EKS Publishing. The Berkeley based publisher has expanded its vision and printed books in various categories. Bible, Hebrew, children’s books, educational materials, music, and modern Hebrew are some of the genres that they have previously worked on. The feeling of finding and printing impactful materials and stories for young Jewish people and children is what fuels the publishing company. They don’t accept unsolicited submissions but keep an eye on the website for any changes. Do you know of any other Jewish children’s book publishers? Please tell us about them in the comments box below!